There is no better way to start off the holidays than informing everyone you know and love that you’re thinking about them this year. The Christmas Holiday Flyer is a whimsical pre-designed flyer that allows you to write any message you want and send it out as quickly as possible. The design looks professional and full of holiday spirit. All you need to do is write your message or simple greetings. You can also use the template as an invitation if you plan on hosting an event this year! Connect with the people you love this holiday season by spreading joy with this great template. Once you have downloaded the free file below, containing the Holiday Invitation, you can start to edit and enter your holiday message! The fun and festive template is very simple and straightforward to use. Simply highlight the pre-written text with your mouse and press the “Backspace” button. Now you are free to type your amazing holiday message. 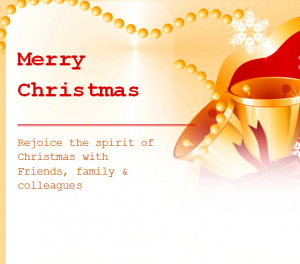 The Christmas Invitation template is designed to use as an invitation or a greeting card. In the blank space in the top section of the page write a nice short greeting that encapsulates the holiday spirit. If you want to write something more meaningful or personal, you can add that message at the center, to emphasize its importance. As an invitation, you can start by listing the major details of your event at the top, then the location, time, and what to bring at the bottom of the page. Once everything is just the way you want it, simply click the “File” button at the top of your page and select the “print” option from the drop-down menu. Send out the holiday spirit this year with these whimsical invitations! Announce your holiday celebrations this year with the Christmas Invitation!